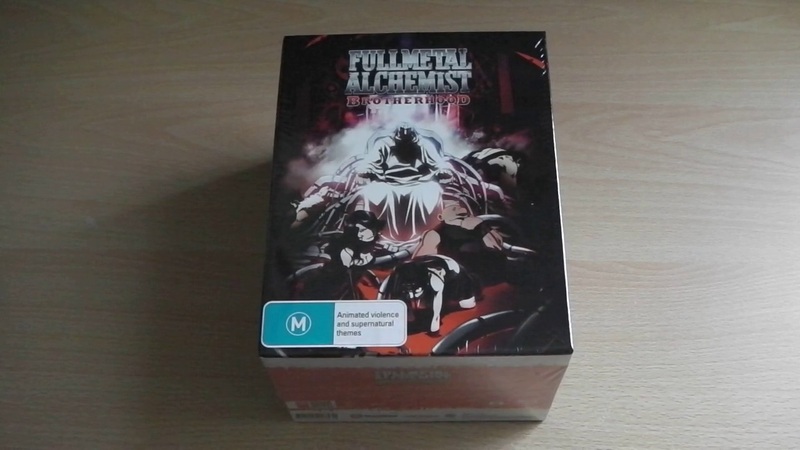 Usually i’d only do one unboxing video per Blu-ray release, however seeing as i recently picked up both instalments of the Fullmetal Alchemist: Brotherhood Collection i’ve decided to unboxing them together, that way you can see ‘exactly’ what you’ll get and how they interact with each other. The heavens tremble and the planet quakes as the souls of heroes and villains teeter on the edge of darkness and light. The final chapter is here, but what did we think of it? 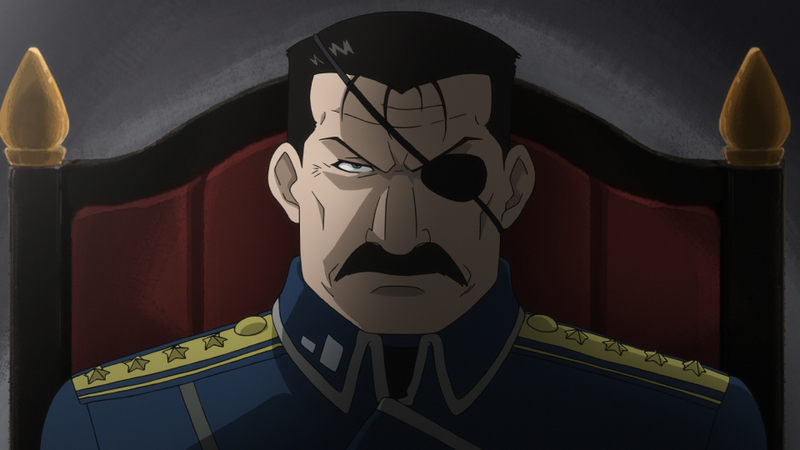 Find out in our Blu-ray Review of Fullmetal Alchemist: Brotherhood – Part 5. 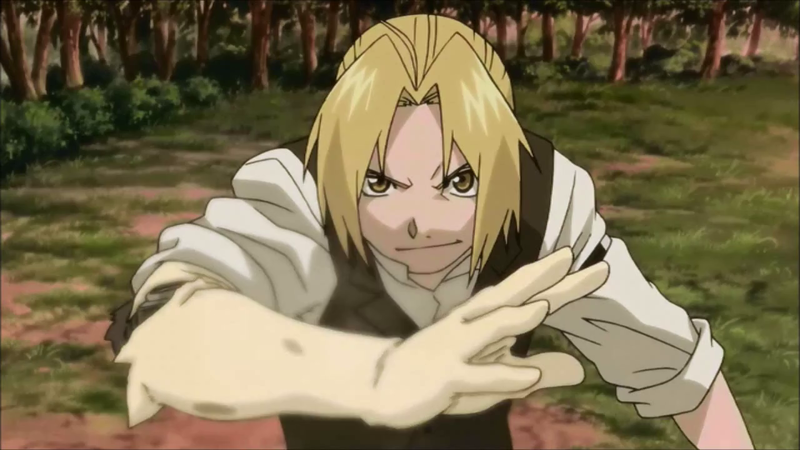 Manga Entertainment UK have today announced, via the latest podcast episode, that the previously confirmed complete Blu-ray box set of Fullmetal Alchemist: Brotherhood will now be released as two separate parts. Originally the idea was for Manga UK to release the complete series on one eight-disc Blu-ray set, however due to distribution rights it will now be released over two four-disc Blu-ray sets, which mimic’s how the series was released in America last year. The first half of the series will contain Episodes 1 – 33 and it will be released on the 27th May 2013, where as the second half of the series will contain episodes 34 – 64 and it will be released on the 14th October 2013. Furthermore the first half (i.e Part 1) will include a UK-Exclusive art box / carded sleeve which can fit both half-season sets into it, thus giving the impression that you own a complete series box set. Both half-season sets will be priced at a SRP of £45.99, but online prices will be slightly cheaper and Manga UK will continue to release the individual volumes (parts) of Fullmetal Alchemist: Brotherhood at a SRP of £24.99, with Part 4 also being released on the 27th May 2013. 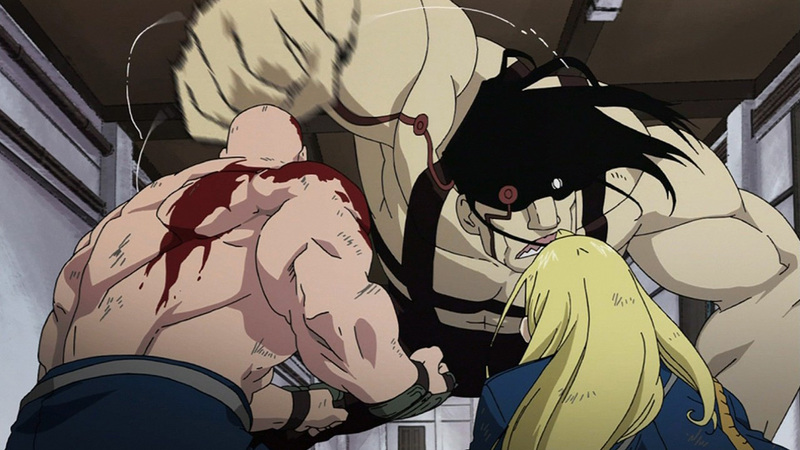 The first half of the series will be released on the 27th May 2013, but for the mean time Fullmetal Alchemist: Brotherhood – Part 3, which contains Episodes 27 – 39, has today just been released onto Blu-ray (you can read our review here). 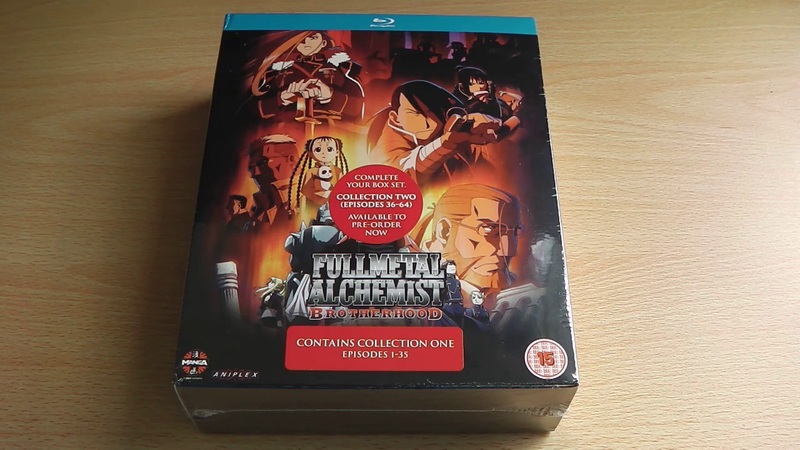 It has been a long wait, but the Blu-ray release of Fullmetal Alchemist: Brotherhood – Part 3 is finally here within the UK, so what exactly is included? Find out in our Blu-ray Review. 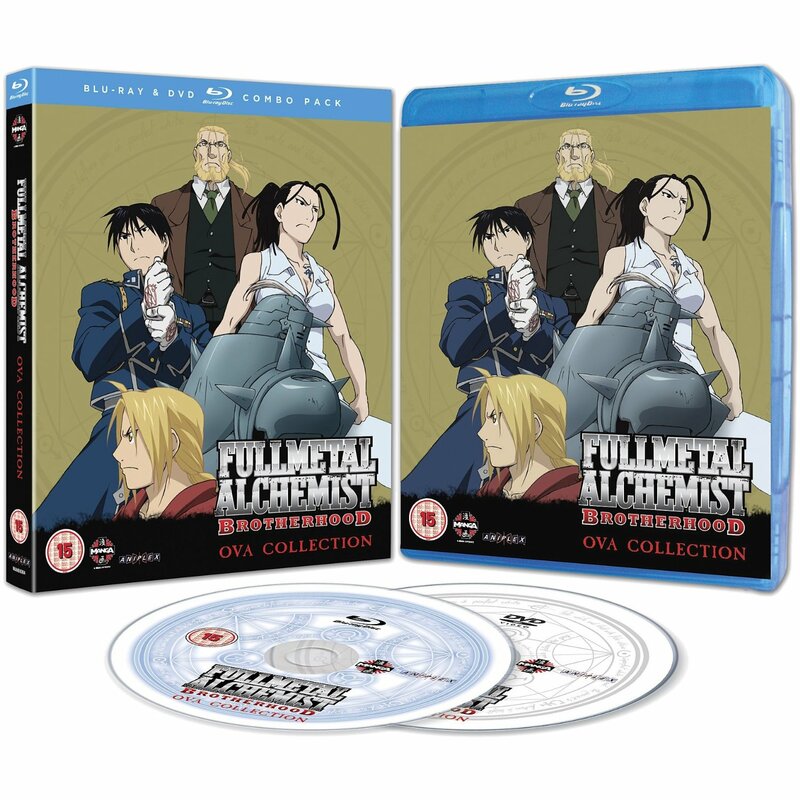 Manga Entertainment UK has recently released what could ‘possibly’ be the final confirmed artwork and disc art for their upcoming Blu-ray release of Fullmetal Alchemist: Brotherhood OVA Collection. The overall Box art is very similar to FUNimations release earlier in the year, which we unboxed here, however its the Disc artwork in this UK Release that i prefer more. The american disc art was relatively black and hard to read, where as the UK release is White (DVD) and Blue (Blu-ray), making it easier on the eyes. 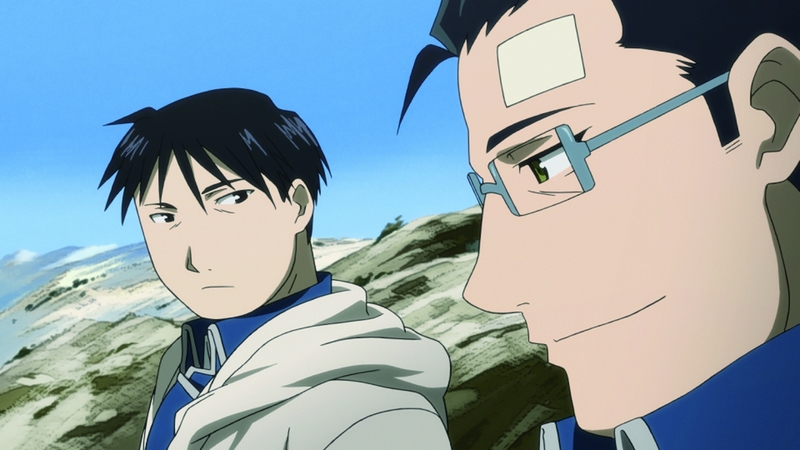 Fullmetal Alchemist: Brotherhood OVA Collection contains four 30 minute long OVA Episodes, which fill in the gaps in some of Broterhood’s timeline, as well as 16 Comic Episodes – all of which are contained on one Blu-ray disc and one dvd disc. Fullmetal Alchemist: Brotherhood OVA Collection is now available to pre-order in the UK for around £17 from a variety of online retailers such as Amazon, HMV and Play and it will be released on the 15th October 2012. Manga Entertainment UK have today confirmed that the Blu-ray Movie Double Pack, which features both Fullmetal Alchemist – The Conqueror of Shamballa and Fullmetal Alchemist: Brotherhood – Sacred Star Of Milos on Blu-ray has been delayed until December 2012. 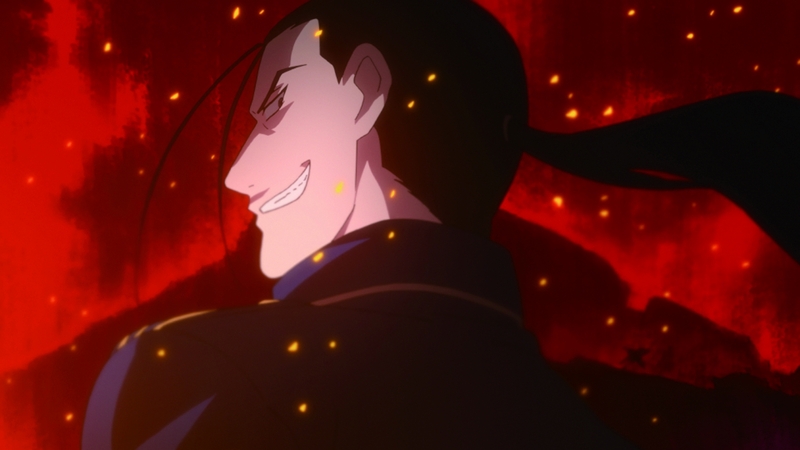 According to MangaUK’s Twitter account the reason for the delay is due to a production issue with the Conquerer Of Shamballa Blu-Ray, thus the whole boxset has been pushed back until December, so that the problem can be resolved. This means that in December 2012, Manga Entertainment UK will be releasing Fullmetal Alchemist – The Conquerer Of Shamballa as a standalone disc and as a Movie Double Pack at the same time. The Release of the DVD Movie Double Pack and the single Blu-ray release of Sacred Star Of Milos have been unaffected and will still be released on the 3rd September 2012 within the UK.